Review of Boustan et al., "Jewish Studies at the Crossroads of Anthropology and History"
Raʻanan S. Boustan, Oren Kosansky, Marina Rustow, eds. Jewish Studies at the Crossroads of Anthropology and History: Authority, Diaspora, Tradition. Jewish Culture and Contexts Series. Philadelphia: University of Pennsylvania Press, 2011. 424 pp. $69.95 (cloth), ISBN 978-0-8122-4303-1. Jewish Studies at the Crossroads of Anthropology and History is an ambitious edited volume that includes a number of rich and important essays. I call it ambitious because--as outlined in the extensive introduction--it seeks to address and overcome a number of the theoretical problems that have long dogged Jewish studies as a discipline. These include homogenizing and essentializing the “Jewish” object and subject of Jewish studies; the reification and simplification of insider-outsider divides and relationships; the focus on text and textual analysis over a more embedded approach that examines the lived experiences that enable textual production, circulation, and interpretation; and approaches to diaspora that project certain kinds of contemporary Israeli concerns (center versus periphery, homeland versus exile, civilized Westerners versus primitive orientals) onto very differently organized worlds. These are important critiques of contemporary Jewish studies that deserve considerable attention and reflection. Ra’anan S. Boustan, Oren Kosansky, and Marina Rustow seek to overcome these limitations by combining textual and cultural, synchronic and diachronic, and top-down and bottom-up analyses that represent the best possible fusion of contemporary historical and anthropological approaches. The volume is thus organized around three large themes--“Authority,” “Diaspora,” and “Tradition”--rather than by historical period, geographical region, research question, or disciplinary approach. The Daily Mail has a long article on the codices which sums up most of the information and, especially, misinformation published thus far about them. With the exception, of course, of Peter Thonemann's demonstration that the Greek on one of the codices is an obvious and crude forgery. Somehow they missed that one. The image is eerily familiar: a bearded young man with flowing curly hair. After lying for nearly 2,000 years hidden in a cave in the Holy Land, the fine detail is difficult to determine. But in a certain light it is not difficult to interpret the marks around the figure’s brow as a crown of thorns. The extraordinary picture of one of the recently discovered hoard of up to 70 lead codices – booklets – found in a cave in the hills overlooking the Sea of Galilee is one reason Bible historians are clamouring to get their hands on the ancient artefacts. If genuine, this could be the first-ever portrait of Jesus Christ, possibly even created in the lifetime of those who knew him. The image in question looks very much like an attempt at a reproduction of ancient Helios imagery. As Bill Hamblin comments, "This is kind of like seeing a portrait of Jesus on a pancake." Most of the rest of the article contains material I have already commented on at length in earlier posts, so I will focus on a few specifics. Astonishingly, one of the booklets appears to bear the words ‘Saviour of Israel’ – one of the few phrases so far translated. I certainly haven't seen that. Photo please. In any case, "Savior of Israel" is a perfectly good title for God (cf. Isaiah 43:3, 45:15) and need not have anything to do with Jesus. A sealed book containing sacred information was mentioned in the biblical Book of Revelations. This interpretation of the books as proto-Christian artefacts is supported by Margaret Barker, former president of the Society for Old Testament Study and one of Britain’s leading experts on early Christianity. As I noted back in late April, Margaret Barker has not made a public comment on the plates since Thonemann' debunked the one conclusively. If genuine, it seems clear that these books were, in fact, created by an early Messianic Jewish sect, perhaps closely allied to the early Christian church and that these images represent Christ himself. 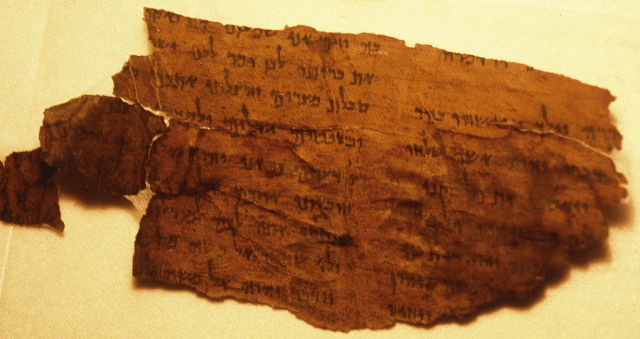 However another theory, put forward by Robert Feather – an authority on The Dead Sea Scrolls and author of The Mystery Of The Copper Scroll Of Qumran – is that these books are connected to the Bar Kokhba Revolt of 132-136AD, the third major rebellion by the Jews of Judea Province and the last of the Jewish-Roman Wars. Robert Feather is a metallurgist who has written a highly speculative book on the Dead Sea Scrolls. He is not an "authority" on the Scrolls. The spiritual leader of the [Bar Kokhba] revolt was Rabbi Shimon Bar Yochai, who laid the foundations for a mystical form of Judaism known today as Kabbalah, which is followed by Madonna, Britney Spears and others. Yochai hid in a cave for 13 years and wrote a secret commentary on the Bible, the Zohar, which evolved into the teaching of Kabbalah. Feather is convinced that some of the text on the codices carry the name of Rabbi Bar Yochai. Again, where is the photo? But it would be interesting if this turned out to be correct. I suspect that the codices were originally concocted to appear to be ancient Jewish texts and then somewhere along the way someone (Elkington?) got hold of them and then torturously tried to map early Christianity onto them as something that would sell better. And so it has. Oh, and the Zohar is a medieval pseudepigraphon. Saida, who is in his mid-30s and married with five or six children, claims he inherited the booklets from his grandfather. I like this one. What, did he lose count? Or, more likely, does this indicate that the Daily Mail has not actually interviewed him, at least lately, and so could not clarify this point? Indeed, if you look at the article carefully, it never says that any of the people mentioned in it were interviewed for it. The artefacts have been seen by multi-millionaire collectors of antiquities in both Israel and Europe – and Saida has been offered tens of millions of pounds for just a few of them, but has declined to sell any. You believe that, do you? The samples were then sent to the Swiss National Materials Laboratory at Dubendorf, Switzerland. The results show they were consistent with ancient (Roman) period lead production and that the metal was smelted from ore that originated in the Mediterranean. Dr Northover also said that corrosion on the books was unlikely to be modern. If the lead is Mediterranean, that would be interesting. But unless and until the report is made public, I am disinclined to take much stock in rumors about what it says. The director of Jordan’s Department of Antiquities, Ziad al-Saad, has few doubts. He believes they may indeed have been made by followers of Jesus in the few decades immediately following his crucifixion. I have commented on Ziad al-Saad's perspective here and here. To recap: All indicators are that these metal codices are modern fakes. They may be written on ancient lead, which can be obtained without too much difficulty, but I have seen no evidence that the writing and iconography on any of them are genuine, but rather considerable evidence that they are fake. I have summed up the case against their authenticity here and here. It is perhaps encouraging that some of the more reputable mainstream media have begun shying away from accepting the codices as genuine, and it is left to the Daily Mail (and other still more goofball sources to which I am not going to link) to carry on the charade. For more background, go to the last link above and follow its "background here" link for many, many more posts on the subject. Early reviews of "El Shaddai: Ascension of the Metatron"
El Shaddai is a brilliantly designed visual experience that leaves a wonderful story up for interpretation. It's unlike any game I've ever played in terms of the artistic vision and execution. The game is worth a play off that alone. But the nuts and bolts of this combat game leaves something to be desired. All the artistic achievement in the world doesn't cover up what is a really simple slashing game. So go play this game, but expect the same dodging, block, and slicing you get from far less creative titles. If Ignition Entertainment had a more balanced approach, "El Shaddai" could have been a transformative game. It relies too much on visual fireworks and forgets about building a solid structure to support. The gameplay unfolds unconventionally and avoids the linear video game tropes, but the plot isn't explained well. Despite its flaws, "El Shaddai" is a worthwhile experience. Just don't expect anything well-rounded or polished. For a game dealing with angels, it falls short of being heavenly. he visual variety makes an unpredictable game that much more surprising, but it's the insane skill with which "Metatron" brings them to life that makes it impossible for even screenshots to do the whole thing justice. Whether altering character states, swapping dimensions or continuously redrawing entire horizons as you race through them, "Metatron's" animation drops jaws with a relentless brilliance that has very few peers. Some people might play through "El Shaddai" and think it's all over the place due to the variety in levels and gameplay, but it's the variety that makes this game so enjoyable. "Ascension of the Metatron" feels like it's an indie game that was made with a major budget. Making use of topics that generally don't used for games, art styles that you'd never see in the same game (if at all), and gameplay that doesn't get old quickly, "El Shaddai" keeps you playing because you don’t know what to expect next, and that's what great games should do. A game like El Shaddai is something that comes along only a few times in each console generation. The beautiful visuals, fantastic environments, solid (though slightly flawed) gameplay, and rich mythology combine to make a game quite unlike anything you've ever played. It has its occasional frustrations, but when the overall experience is this fantastic, you will be more than willing to put up with a few little annoyances. Above all, El Shaddai is a gaming experience you won't soon forget, and one that's worth every penny of its price of admission. The occasional irritation from getting knocked off a giant clock face by an intentionally low-poly arm, or of not being able to see my shadow in a shifting miasma that's supposed to be a rock, fades away. The experience of a game so elegantly, artfully designed in both mechanics and visuals is something that will stay with me, even if the plot wasn't totally coherent. Background here and many links. Review of Miles, "Carthage Must Be Destroyed"
Carthage Must Be Destroyed: The Rise and Fall of an Ancient Civilization. Richard Miles. Viking. 2011. 544 pages. England and France. Greece and Persia. Hapsburgs and Ottomans. Imperial rivalry is as old as history itself, but some rivalries can truly be said to have changed the world. The great contest between the Mediterranean city-states of Rome and Carthage falls into that category. At the end of three Punic Wars stretching over a century (264-146 BC), Carthage was literally wiped off the face of the earth. But in this fascinating new history, University of Sydney historian Richard Miles reconstructs a civilization whose memory continues to stir imaginations -- particularly among those who suspect that their own is not immortal. Earlier reviews here and here and links. A bit of shameless self-promotion: A pre-production description has recently been released by State University of New York Press, announcing the publication of my first book, Arguing with Angels: Enochian Magic and Modern Occulture. It is due in May 2012. As SUNY’s summary states, the book is an exploration of the Elizabethan philosopher John Dee’s system of angel magic, but in particular its reception history and various reinterpretations in modern times. It follows the creation of what is usually known as “Enochian magic”. Since 19th century occultism, and continuing in 20th century and contemporary occulture, this system has been understood in a variety of ways as it has become embedded in a number of different occult currents and practices. I am currently working on (back-burner) a paper on phenomenological parallels between John Dee's Enochian revelations and the visions in 4 Ezra, and I look forward to seeing this book when it comes out. ASKING THE IMPORTANT QUESTIONS: I want to know the age of King Og At the time of his death. Much more on Og the giant here with links and here. For the record, I now doubt that the Phoenician inscription Byblos 13 refers to Og the giant. CAN'T MAKE IT UP—Speed dating in Zedekiah's Cave for the 15th of Av: Israeli singles look for new love in ancient cave (AP). Some background on Zedekiah's Cave is here. Tell them to keep an eye out for the Ark of the Covenant and the Temple treasures. Helena (c 249-c 329) was the mother of Constantine the Great, the first Christian emperor. She is held up to reverence as the discoverer of the Cross upon which Jesus was crucified. St. Helena did travel around the Holy Land looking to locate relics and sites associated with Christian origins, but Eusebius doesn't refer to her finding the true—or any—cross, and the story only surfaces a generation or two later, so it should be taken with a good grain of salt. In any case, the article has some interesting background on her. The hero Hercules, of Greek and Roman mythology, was born in Thebes. He is the son of the god Zeus and the mortal Alcmene, a woman from Electryon. Hercules is considered the strongest man in the world, a symbol of power, courage and superhuman strength; one of the most famous legendary heroes of ancient Greece who battled the forces of the netherworld on behalf of the Olympian gods. Hercules is described as hot tempered, and he often times acted impetuously and with uncontrollable rage. Greek mythology has it that Zeus’ wife, Hera, expressed her jealousy and fierce hatred of Hercules from the day he was born because he was the product of her husband’s infidelity. While he was just a baby Hera placed two poisonous snakes in his bed, but he managed to overpower them. Later, in a fit of madness brought on by Hera, Hercules killed his three sons and his wife Megara, whilst she attempted to protect the smallest of them. In order to atone for his terrible sin, the Oracle of Delphi ordered Hercules to go to Eurystheus, king of Mycenae, and perform whatever the king commanded him to do. Among the king’s commands were twelve superhuman feats known as the ‘Labors of Hercules’. Depictions of the labors of Hercules are among the most common themes in ancient art and the statue that was discovered portrays Hercules’ first task. Horvat Tarbenet is located in the Jezreel Valley, three kilometers northeast of Kefar Barukh, and four kilometers northwest of Afula. Tarbenet was a Jewish settlement in the third century CE, which is mentioned in the Jerusalem Talmud (Megilla 4, 5). The story is told of a local teacher who would teach the Ten Commandments very quickly, so rapidly that his students could not understand him. The townspeople asked the teacher to take a break between each passage so they could follow him. The teacher refused because “the sages forbade one from stopping while reading the words of Moses”. The teacher’s refusal even received the backing of Rabbi Hanina. The teacher continued to teach as he did until the residents fired him. In an archaeological excavation conducted at the site remains were discovered, among them dwellings, a built well and an installation that included a large pool which was probably part of a Roman bathhouse. Benches were found on two sides of the pools. The well, which is 2.90 m in diameter and in excess of 4 m deep, had a saqiye type pumping installation constructed above its opening. A drainage channel that extended as far as the pool was built alongside the well. It seems that the well and channel were meant to supply water for the pool. After the pool was no longer being used it was filled in with a layer of earth that contained numerous potsherds, an abundance of broken glass vessels and the marble fragment of the statue of Hercules. The complex that was discovered apparently underwent a number of changes and it is dated to the Roman and Byzantine periods, until the beginning of the Early Islamic period. At the beginning of the last century the legendary Valley Railway linked Haifa with Damascus. Recently the Israel National Roads Company commenced work renewing the rail line with the necessary changes in its route. The new Valley Railway, which is c. 60 kilometers long, will carry passengers and freight between Haifa, Afula and Bet She'an. In certain places the new track will pass alongside the route of the historic Valley Railway. JAMES MCGRATH: September 2011 Biblical Studies Carnival – Early Edition. Very thorough. I think this is the first time that the Biblical Studies Carnival has had two editions slated for a single month. THAT NEW HEBREW FRAGMENT OF BEN SIRA from the Cairo Geniza (noted in January here) has now been published in Dead Sea Discoveries. Ophir Münz-Manor has the link and a couple of corrections to the readings over at the Talmud Blog. THE HEBREW UNIVERSITY BIBLE PROJECT is profiled by the AP: In Jerusalem, scholars trace Bible's evolution. If I may hazard a prediction, I expect that Moore's Law will shave a good many years off that estimated completion date of two hundred years from now. NEW TESTAMENT APOCRYPHA WATCH: Alin Suciu: New Fragments from the Sahidic Version of the History of Joseph the Carpenter. Review of Hoffman & Cole, "Sacred Trash"
A scholar named Solomon Schechter traveled to Cairo 120 years ago to do what so many Western explorers, scholars and archaeologists had done before and have done since: to unearth a treasure trove of fragments of the past, and take them back to Europe to be studied and preserved. But while “Sacred Trash: The Lost and Found World of the Cairo Geniza,” by Peter Cole and Adina Hoffman, tells the tale of yet another spiriting away of a piece of Egypt’s wealth of ancient history, the Geniza, it also tells of years of meticulous and devoted scholarship, and sheds light on an era of Cairo’s history that is long forgotten. Earlier reviews etc. here and links. A MAN CUTTING turf in Springmount bog in Ballyhutherland, Co Antrim, found this set of six yew tablets, held together by leather straps. The inner tablets are hollowed out on both sides, forming the pages of a small wooden book. These inner surfaces are filled with wax, on which someone wrote, or rather literally inscribed with a pointed stylus, a biblical text. This is the earliest extant Irish manuscript. Someone, a monk or a scholar at a monastic school has written, onto the wax, parts of Psalms 30 and 31 from the Old Testament in a beautifully precise hand. (HT Abu 'l-Rayhan Al-Biruni.) Follow the link for a photo. I assume these psalms come from the Latin Vulgate, although the article does not specify this. This manuscript is not to be confused with the Irish Bog Psalter, which also contains Latin biblical psalms, but is made of vellum and is slightly later. Note also the Staffordshire Anglo-Saxon Gold Hoard, which contains a piece bearing a Latin biblical quotation, possibly also from the book of Psalms. Duke Databank of Documentary Papyri (256 vols. ), free! The Duke Databank of Documentary Papyri (256 vols.) is a collection of rare ancient manuscripts. These documents were written on various forms of writing material including papyri, ostraca, and wood tablets. This collection is solely compiled of documentary papyri: personal letters, receipts, various political documents, and other correspondence. Best of all, this entire collection is free. There’s no catch. No strings attached. It’s rare that ancient works like these are made available for free to as many people who want them. It’s even more amazing when you consider that these aren’t just PDFs or text files. They’re Logos books, and they take advantage of many of the features and tools built into Logos Bible Software. So it’s hard to put into words how phenomenal this opportunity really is. Please note that this collection requires the latest version of Logos Bible Software 4.3. JERUSALEM, ISRAEL - A smartly-dressed middle-aged man sits in front of me, arm draped snugly around an attractive and be-jewelled lady, clearly half his age. He and his jet-set friends have purportedly paid 2200 Shekels per seat. ($640 US). I sit alone but free, courtesy of Israeli tourism, and what a seat it is! I'm ensconced at the base of Mount Masada, a UNESCO World Heritage Site where the Israeli Opera company is dramatically producing Giuseppe Verdi's famous Aida, the Italian maestro's masterpiece amongst his 28 written operas.